They're kind of funny looking. Not sure we've actually ever seen one before! A male antelope running away from us. And then he stopped to have a look. The pronghorn antelope is said to be the second fastest land animal in the world! He can do short bursts up to 90 km/h (55 mph) and can run at 60 km/h (35 mph) for sustained distances. We are located right at the top of it's range, as you can see from this map taken from the wikipedia article. 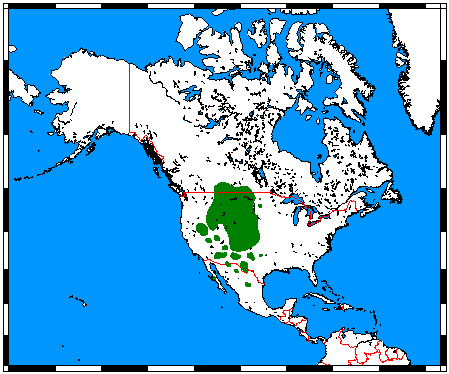 Range of the pronghorn antelope. It rained pretty much all day yesterday. Just a dreary day. So we didn't get much done, but that's okay because the next few days are supposed to be just fine. The sky is currently clear and blue and the sun is shining brightly this morning! And other than the fact that it was damn cold last night at -4C (23F), that should be the last of the below freezing weather...with any luck at all! Only four weeks from today and we get to see them again! Don't feel bad Kevin, it was 2C in Kelowna last night. I don't see anyone using the pools here yet. The bright side is that we know the cold weather won't last much longer, at least that is what we are hoping for! Guess it will be a while before the pool will get used at that rate. Cameron looks like he likes to ham it up for the camera as much as our grandson, Taylor. Yep, just like every other kid we know, even the kids in Africa did too! They just don't get any cuter than that! That's exactly what we think too! Very nice place. Is it warming up? Let's hope. Looks like it should be, it was actually not too bad today. Oh, Kevin and Ruth: What fabulous photos of Cameron and Sadie. They look like such happy and healthy kiddos. Enjoy every single moment you can; I feel like an authority regarding how fat those little cherubs grow and change. This coming weekend my daughter and granddaughter are going 'shopping' for a location and facility for my granddaughter's wedding! Yikes, it seems like yesterday when I was at her birth! Also, I just feel like we, your followers, have to continually remind you two that days off, relaxation, chances to just sit around and read, etc. are OKAY! The people to whom you'll be reporting in this job are going to be so happy with their choice of you two - some of the most diligent campground managers in the World!!! Thank you so much Mary-Pat, we may be a little prejudiced but we think they are just the best and the cutest. You, are right, they do grow up fast. Hard to believe you have a granddaughter that is old enough to be getting married, you must be so excited. Don't worry we will find some time to relax but right now we need to get the campground ready for the first day of camping for this season and it's not too far away. I couldn't agree more with Mary-Pat. The camp folks lucked out with you guys. 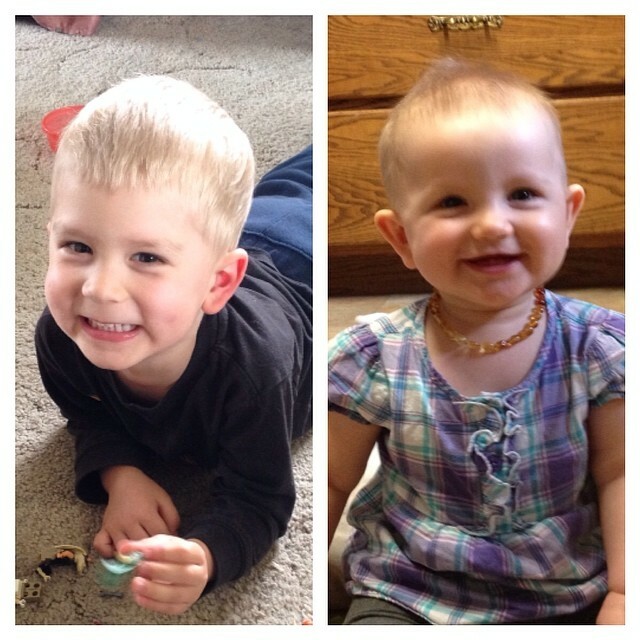 As for being a grandparent, gosh, how could you not be with those sweethearts! Thank you as well Dianne for those kind words. We certainly like to do our best and we are proud to do it well..
Oh my goodness they are wonderful. All 3 of them. I've never seen Cameron and Sadie until now but I have seen Pronghorn. 23 degrees??? In May?? Wow! Hope it hurries up and warms up for you. Stayed tuned to our blog and you will see more of Cameron and Sadie in June when they arrive here at the campground and stay with us for a few weeks. They are so sweet and both of them are really good. Cameron makes us laugh so much. The temperature is suppose to start warming up any time. Today was quite nice actually. Aren't grandkids simply the best? Cameron and Sadie are so adorable. Love their smiles! They sure are Connie and Barry and yes, grandchildren are the best!